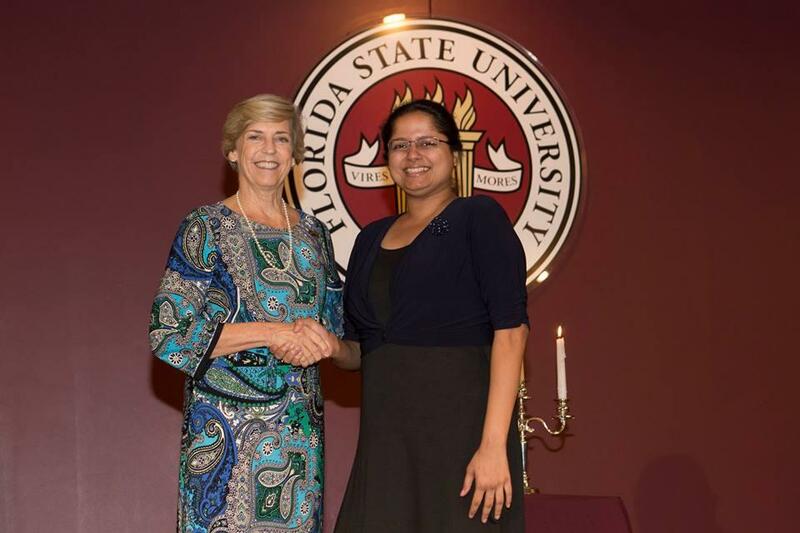 Congratulations to ACM’s Sharanya Jayaraman for her induction into the prestigious Seminole Torchbearer’s program here at Florid State University. Seminole Torchbearers is an organization founded 1986 to keep close bonds with alumni who were student leaders in their time on campus. Since then, over 5,500 alums have been inducted into this prestigious group. Each year approximately 200 junior and senior student leaders are invited to join this elite group. Sharanya was nominated through department member Eleanor McNealy for her dedication to the CS department’s ACM organization. Sharanya actively helped out advising students, helping them out with schedules, helping them find tutors for the harder classes, organizing workshops on topics that are not taught in courses, and helping to improve the overall student experience in the department. She also is a strong female voice for the ACM and its women’s division. Once again congratulations on Sharanya for representing the leadership of the department on a university wide scale.